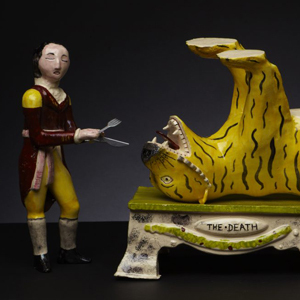 The TRILOGY OF DEATH comprises two modern interpretations and a copy of the Staffordshire Potteries piece, *The Death of Munrow ca. 1810 from the V&A archives. The two ’companion pieces’ use elements of the original imagery to remark on contemporary social issues. The Death of Sainsbury’s turns everything both metaphorically and literally on its head commenting on the simplicity of the food chain and the predominance of supermarkets within it. 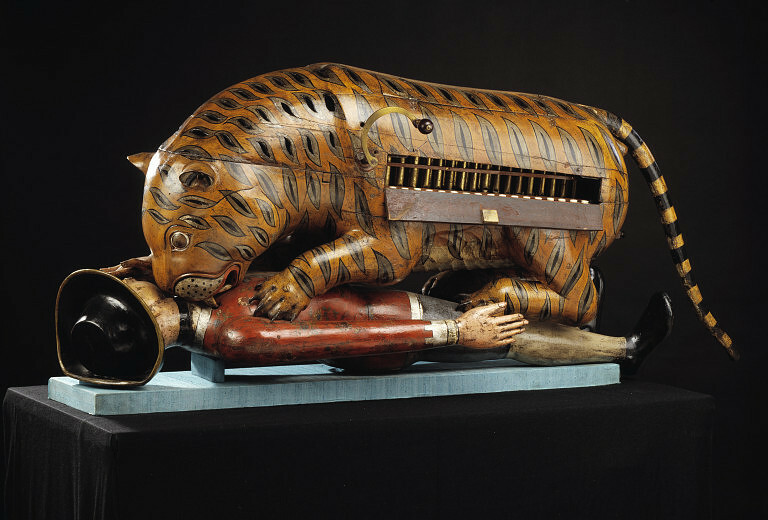 The Death of a Species references the over hunting by man and subsequent extinction of three subspecies of tigers. 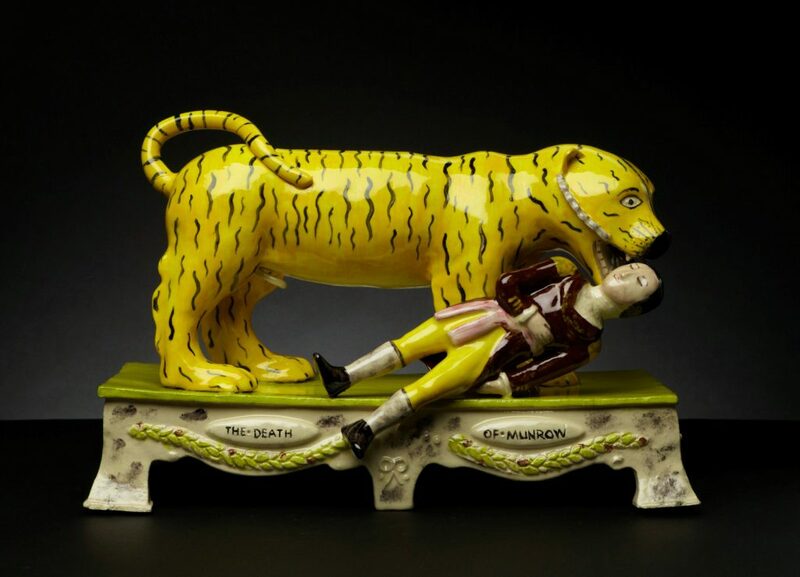 This delightfully naïve ceramic sculpture shows the death of Lieutenant Hugh Monro, a young British army officer serving in India, who was mauled by a tiger while picnicking on a hunting trip in 1792. 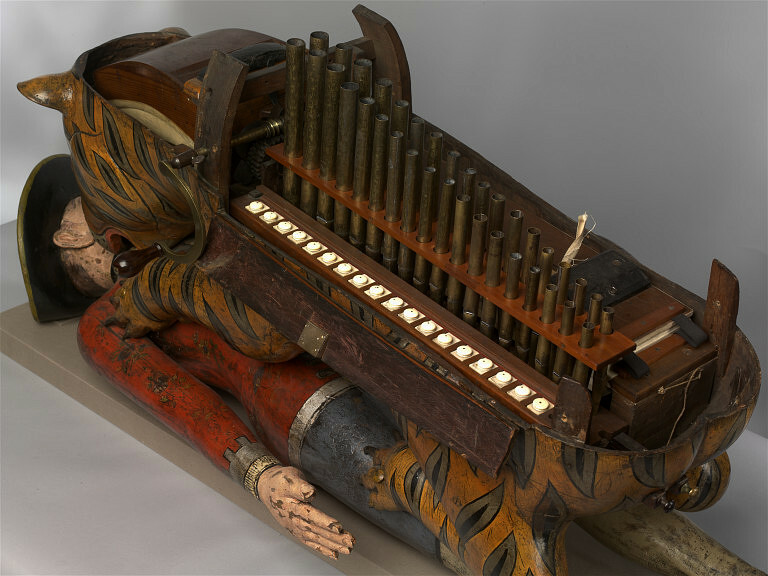 Monro’s gruesome death is said to have inspired the creation of the automaton and mechanical organ ‘Tippoo’s Tiger’. 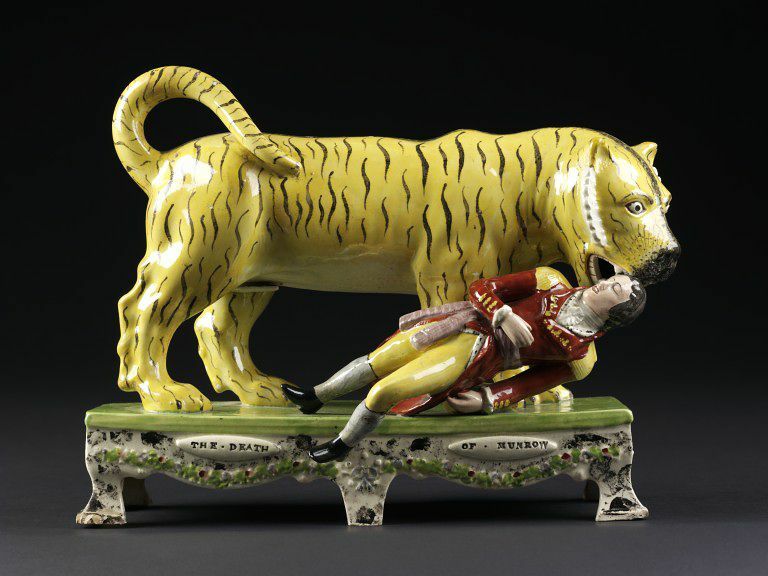 One of the V&A’s most popular exhibits, ‘Tippoo’s Tiger’ was made for the Indian ruler Tipu Sultan, who so loathed the British and identified with the power and ruthlessness of the tiger that he became known as the ‘Tiger of Mysore’. 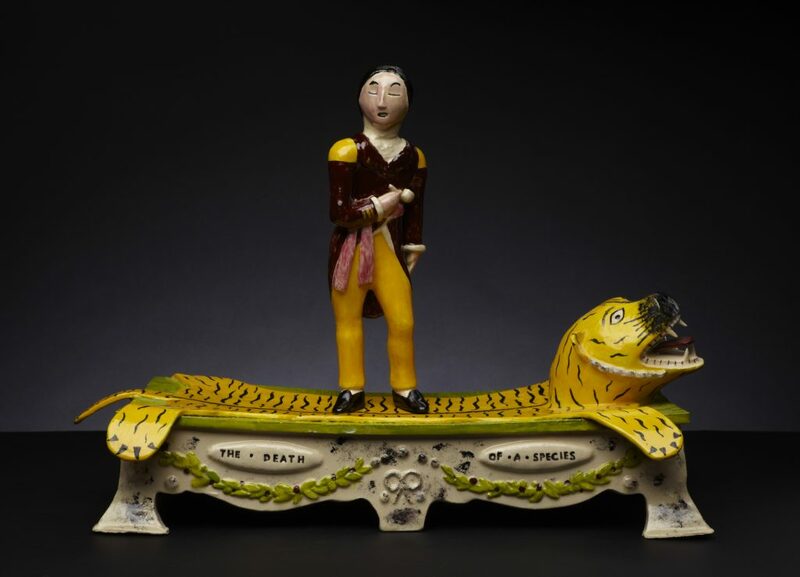 The ceramic group echoes the design of the automaton, and it is possible that its sculptor (attributed to Obadiah Sherratt) knew the piece, as it was illustrated in prints and exhibited in London after it was seized by the British in 1799. 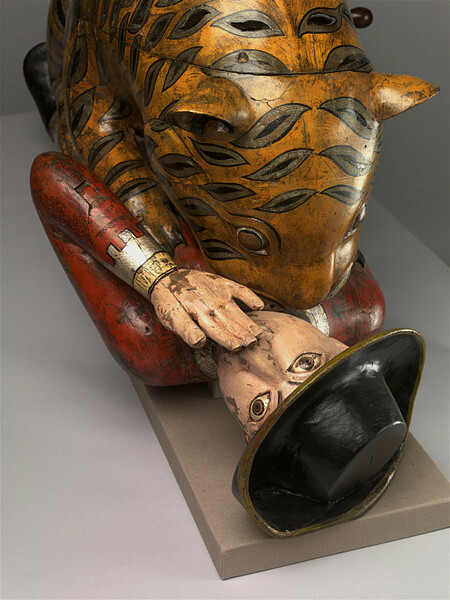 Monro reclines stiffly at the feet of the tiger, apparently blissfully unaware of his fate – an effect that was probably the result of the sculptor having simply reused the model or moulds for a standing military figure without adapting in any way it for its new context. 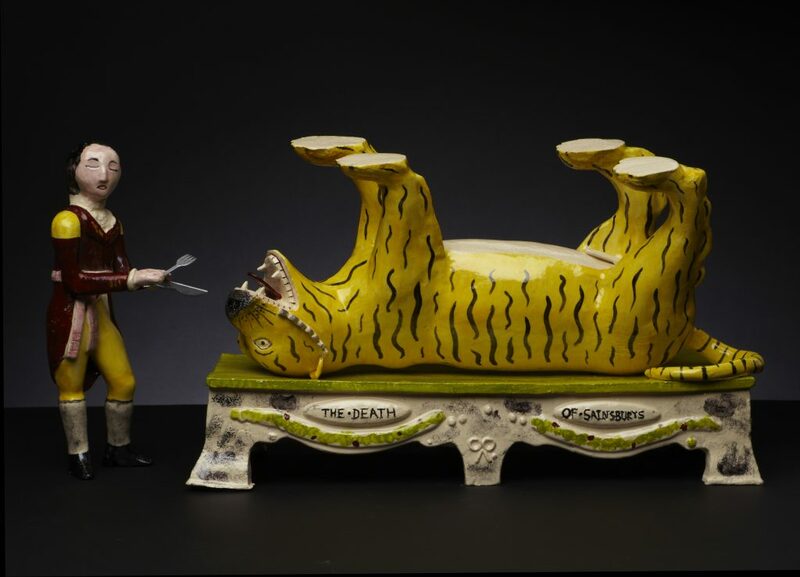 Pottery groups of ‘The Death of Munrow’ were first made in Staffordshire in the 1810s, and they remained in production until about 1830, when this version with a ‘table-top’ base was made.